Looking for a New Volvo XC60 in your area? CarGurus has 298 nationwide Volvo XC60 dealers with 25,083 new car listings. 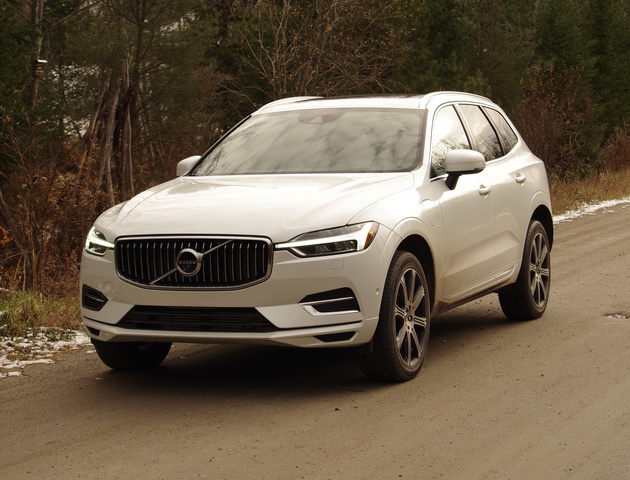 Last year, Volvo executed a successful redesign of its compact XC60 luxury crossover, bringing an athletic shape, refined luxury, and cutting-edge technology to the model. For 2019, it gets minor updates. Amid a segment of complex, attention-grabbing vehicles, the XC60 continues to impress with its elegant exterior. The proportions are classic, with a tall greenhouse and long hood. Minimal chrome details mark this as a luxury crossover. Drivers can easily identify the XC60 by Volvo’s trademark “Thor’s Hammer” LED signatures up front, along with its full-height taillights. The interior shows the same restraint as the outside. Controls are arranged in logical groups, such as the row of buttons that control the car’s media functions. And rather than trying to squeeze in a third row, Volvo simply provides ample room for five people. All three of the XC60’s powertrains make a return for 2019. T5 is the base variant, consisting of a 2.0-liter turbocharged inline 4-cylinder engine with 250 horsepower and 258 pound-feet of torque. Up until now, T5 was only available with all-wheel drive (AWD), but the 2019 model includes a front-wheel drive variant (FWD) that shaves a not-insignificant amount off the price sticker. T5 can hit 60 miles per hour in as few as 6.4 seconds. The FWD T5 returns 22 mpg city, 29 mpg highway, and 24 combined. AWD sees a slight dip, 20 mpg city and 27 highway using premium fuel. The T6 gets a 2.0-liter turbocharged and supercharged inline 4-cylinder engine good for 316 hp and 295 lb-ft. AWD comes standard, plus it offers a 5.6-second 0 to 60 run. The T6 returns 19 mpg city and 27 highway. The T8 eAWD tops the range, pairing the T6’s basic engine with an electric motor for AWD plug-in hybrid capability. In addition to 400 hp, 472 lb-ft, and a 4.9-second run to 60 miles per hour, the T8 can travel 17 miles on electric-only power. All XC60s are paired to an 8-speed automatic and offer stop-start functionality. The T8 returns 26 mpg combined for gasoline only; with electric and gas, it returns 58 mpge. The XC60 spreads across three grades: Momentum, R-Design, and Inscription. Momentum comes generously equipped with 18-inch alloy wheels, a panoramic sunroof, keyless access and start, an 8-inch color instrument cluster display, SiriusXM satellite radio, LED headlights, LED taillights, a power tailgate, dual-zone automatic climate control, power front seats, driver-side memory settings, an auto-dimming front mirror, and a 9-inch touchscreen infotainment system with Apple CarPlay and Android Auto. Leatherette is now standard on Momentum, with leather as an option. R-Design and Inscription trims have similar features, but different themes. Where Inscription is tranquil and polished, R-Design is loud. R-Design gets unique aggressive bumpers, side-skirts, wheels, sportier paint colors, and an R-Design grille. Inside, it gets special athletic seats with a leather and suede upholstery combination. Both trims tack on an LCD instrument cluster, a Harmon Kardon sound system, 19-inch alloy wheels, automatic high beams, passenger memory settings, and power lumbar support. Optional features include air suspension, a Bowers and Wilkins sound system, a heated steering wheel, and navigation. Like most Volvos, the XC60 puts a emphasis on safety. A reversing camera, hill-descent control, oncoming lane mitigation and lane-keeping assist are included on every model. A parking assistant, auto-dimming side mirrors, blind-spot monitoring, cross-traffic alert, adaptive cruise control, and rear-collision mitigation are optional. Naturally, the XC60 aced the Insurance Institute for Highway Safety (IIHS) tests in 2018, earning a Top Safety Pick designation. With a level of style and sophistication that matches or exceeds its competitors, the XC60 remains a strong choice in the compact luxury crossover category. What's your take on the 2019 Volvo XC60? John The Volvo XC60 is hands down a more superior vehicle. The standard technology in the XC60 alone is a reason to buy the Volvo. With lane keeping aid, city safety (Self-Stopping Crash System), the very large center stack screen all standard are very nice. 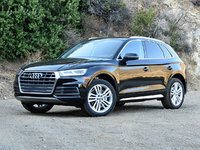 If you are comparing the Audi Q5 to the Volvo XC60 you are in for a surprise. The Volvo's handling on the T6 AWD model versus Audi's 2.0T Quattro (To be fair those are both 4-cylinders), the Volvo smokes the Audi. Volvo's eight speed transmission and 316 Hp and 295lbft of torque @ 1,500 rpms gives you instant power and PLENTY of power if your going 60mph and want to punch it. The power at 55mph will throw you back in the seat! Volvo also offers full air suspension for $1,800 which if you need more ground clearance will raise the vehicle up another 2 inches in "off road" mode and lock the rear differential giving the driver a massive advantage in bad weather like snow or in you want to do some trail riding. The XC60's comfort is also off the charts. The seats are plush and hug you so when cornering you feel secure. Also, my XC60 has massaging seats and vented seats which come in the luxury seat package. Very much worth it but a little expensive and very hard to find. Don't get hung up on finding a car with that package unless you are very flexible as a lot of Volvo Dealers only have a few cars with that package due to it's price. Overall, being a previous Audi owner (2017 Q5 Prestige 3.0T Quattro) and now in a 2019 Volvo XC60 T6 AWD Inscription with air suspension my god why did I ever look at the Audi. Volvo has done something amazing I would never expect but now have HUGE respect for the car brand. Drum roll......Volvo's are fun to drive!! They are fast, handle well and off road even better and have way more technology than Audi's. I start my XC60 every morning with my phone and it's nice and warn once I get in. If your comparing an Audi to a Volvo and want all the bells and whistles plus the more powerful engine the Audi will cost you just as much as the Volvo. The only thing is the Volvo offers more Horsepower and better acceleration now that the inline 6 is gone with Audi unless you get the SQ5 which at that point you would need to compare the XC60 R-Design with a polestar upgrade in that race to be fair and yes the Audi would win but what's the point of buying a SUV strictly for performance? What does the U stand for in SUV. The Volvo gives you heads up display, air suspension, Semi Autonomous Drive with Adaptive cruise control (Meaning you can take your hands off the steering wheel and the car drives itself), Massaging seats and the list goes on and on. So in conclusion, power and handling:Volvo Wins Technology: Volvo Wins, Comfort and style: Volvo Wins or Tie, Cargo Room and utility: Volvo Wins by a land slide. For the money, four cylinder to four cylinder, Prestige to Inscription Volvo has won my heart. The way Volvo has redesigned their vehicles recently makes them very attractive inside and out. God, I know I just made a lot of Audi fan boys mad but someone needs to tell the world the Germans come in second place in this race!! Again, I am not some Volvo fan boy that is obsessed with the this newly transformed Swedish car company. I still have my S7 which I love and will probably never sell but in my opinion Volvo gets a 10/10 on the T6 AWD XC60! Have you driven a 2019 Volvo XC60? Enter your zip to see incentives for a new XC60 in your area. CarGurus has 11,545 nationwide XC60 listings starting at $4,000. What is best overall car Volvo XC60 T5 or Cadillace XT5? Ride, reliabilisty, repair costs?